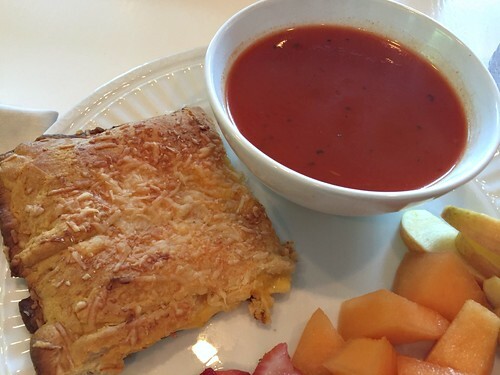 Although I still can’t get my kids to eat tomato soup, they are HUGE fans of grilled cheese sandwiches — actually, they love anything with a lot of cheese! So, in an effort to mix things up a bit from the traditional cheese + bread, I decided to try using crescent roll dough and baking the grilled cheese in the oven. It was SO fast and was SO much easier than buttering 10 slices of bread, monitoring and flipping 5 sandwiches, and trying to serve them before they get cold, but also before they get too brown for my kids’ liking. 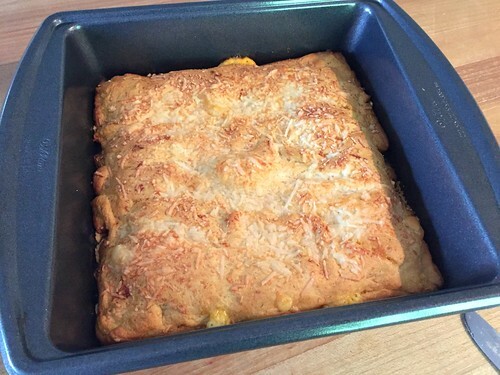 Put 1 T. of butter in the bottom of a 9″ x 13″ pan and put in the oven as it preheats to melt the butter. Once the butter is melted, press 1 package of crescent roll dough in the bottom of the pan — making sure to seal any seams. 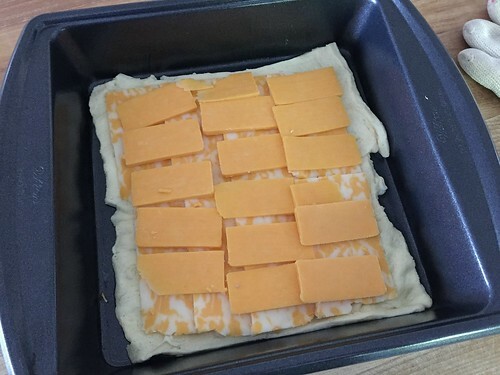 Layer cheese on top of dough, and then top with the 2nd package of dough. 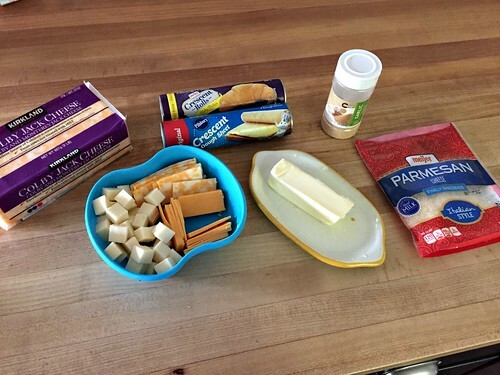 Spread 1 T. of butter over the top layer of dough and sprinkle with parmesan cheese and garlic powder. 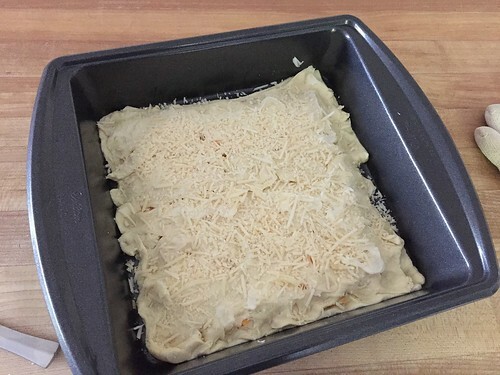 Bake in preheated oven for 15-20 minutes or until dough is browned and cheese is gooey. NOTE: as I mentioned above, I only made a half batch for our family and made it in a 9″ x 9″ pan — so the pictures in this post show a half batch. If you’re planning to serve it as an appetizer, I would cut the “sandwiches” into breadstick-like strips and serve with marinara sauce. In fact, you could even put pepperoni inside with the cheese for a pizza/breadstick appetizer. YUM! 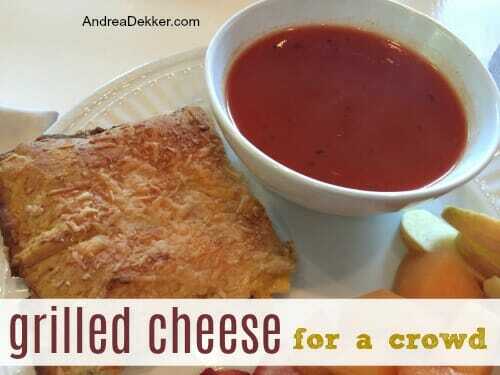 Do you have a favorite grilled cheese “recipe”? These look delicious! I’m sure they’re the absolute best when enjoyed right out of the oven, but how would they be to take to a potluck or as part of a meal for someone & eaten much later? Yum! Also a good way to use up some leftover meat, like shredded BBQ chicken! oh yeah — I never thought of that. Thanks for the great idea! Awesome idea!!! Standing around the stove waiting for grilled cheese to brown perfectly just isn’t realistic for a family with little kids. Will be trying this. When I was working as a nanny some of my charges wanted grilled cheese with peanut butter and jelly. An interesting combination, but I just couldn’t eat along with them. I was all for the peanut butter–not the jelly. And growing up, Mom used to make triple decker grilled cheese sandwiches.Three slices bread, double the cheese and dill pickles. Soooo good. wow — that is a crazy combo (in my opinion). My kids would probably like the pickle addition — might have to try that!! My husband introduced me to pickles with grilled cheese sandwiches after we got married. I thought it sounded like such a strange combination but they are so good together! I keep forgetting to buy pickles but now I start craving them every time we have grilled cheese. We have ours on the side but may just have to try the triple decker idea. Simple and easy! Thanks for this dinner idea, Andrea! These not only sound good, they taste good! My husband can’t stop talking about how great they tasted. Another great recipe from you, Andrea. Thanks so much. Can’t wait to make them again. yay — glad you and your hubby approve!